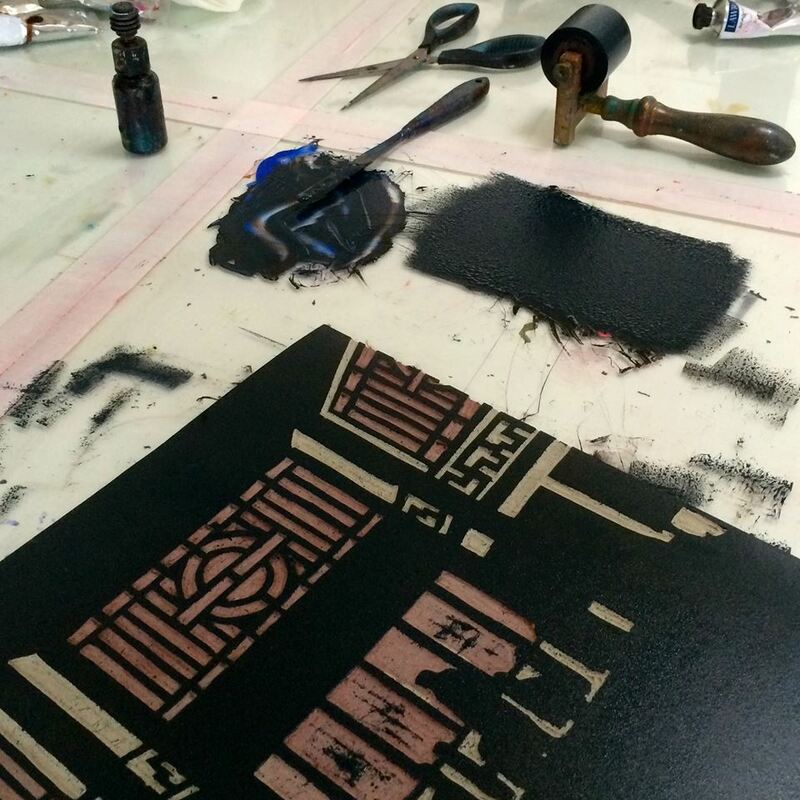 I’m back in the studio this week (cold and gloomy – and that’s both me and the studio, if anyone’s asking…) working on a new linocut. 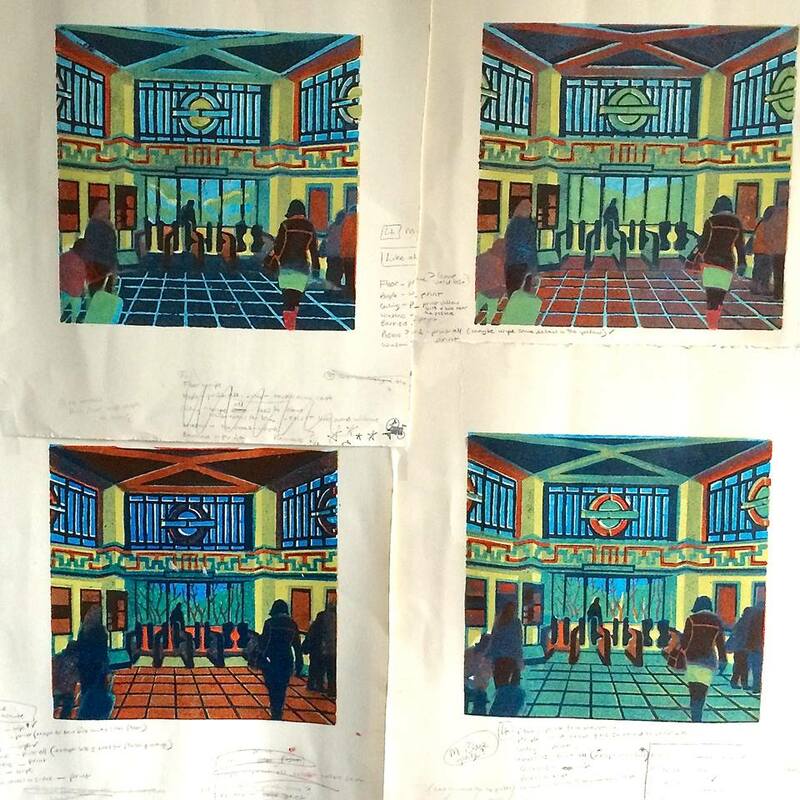 This time it’s of Ealing Common Tube Station – here’s a few pictures of work in progress. It’s actually for a two person exhibition I’m having with Louise Davies in a few months time, at a lovely gallery called For Art’s Sake in Ealing, London W5. And for any London Underground nerds out there (and I definitely fall into that category myself, in case you hadn’t noticed…) the building was built in the early 1930’s by Charles Holden in a style very like his Northern Line ones, such as Balham. It’s constructed in Portland stone and features a tall heptagonal ticket hall with glazed screens to all sides – seriously, I’m swooning as I write this…. I have a new solo exhibition at Cambridge Contemporary Artthis month. 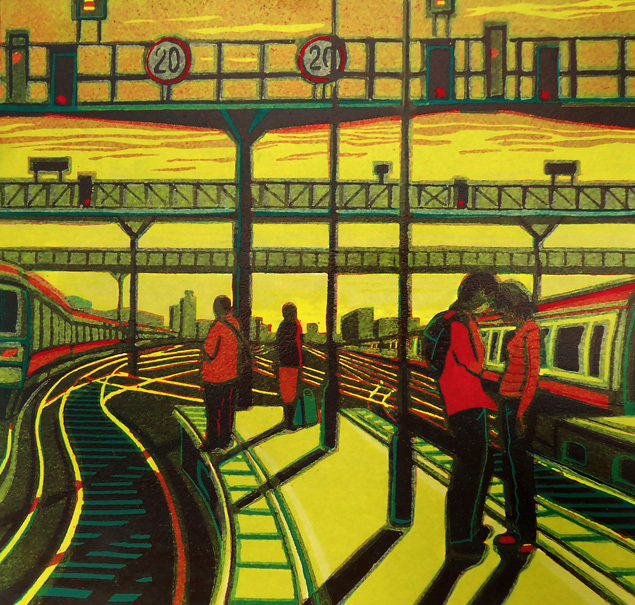 It’s called ‘Destinations and Departures’ and is on until 24thNovember. I have both prints and paintings on show, and I must say, it looks pretty good, mostly due to the expert hanging, of course. Unfortunately, getting to the Private View turned out to be a bit of a marathon. We left London on Friday afternoon at 4pm, expecting to arrive at 5.15pm, looking forward to a quiet drink and a light meal before the opening. Unfortunately the gods had something else in mind for us and after a litany of misfortunes – the usual downpours, accidents, and breakdowns (other cars, and my mental state), we finally arrived at 7.20, a good ten minutes before the end. I had only time to throw down a glass of wine and talk to the handful of visitors remaining. Apparently there had been a queue to get in – I could have been like a film star on the red carpet, only I was stuck on the motorway…. At least it won’t be so bad getting home to London, we thought. After all, that Friday night traffic will be going the other way – but we reckoned without the police completely closing the M11, due to yet another accident. Still, I mustn’t complain, as we had a lovely drive down narrow A roads, along with all the other motorway traffic, and finally arrived home at 10.25, a round trip of six and a half hours. To cap it all, my official photographer (aka partner) had a streaming cold and had been unable to lift his weary arms to take many photos, or even focus the camera properly…. And, looking on the bright side, all that sitting in queues on the motorway has given me some inspiration for a new print – looking towards the Blackwall Tunnel, on the A102. There’s always a silver lining…. Half Moon Studio is having an exhibition in a rather special setting – at the Rectory Gallery in Spitalfields. This is the result of a collaboration between Andy Rider, Rector of the historic Hawksmoor Christ Church and Jill Hutchings of the Curwen Gallery in Fitzrovia, to show contemporary art within a period setting. 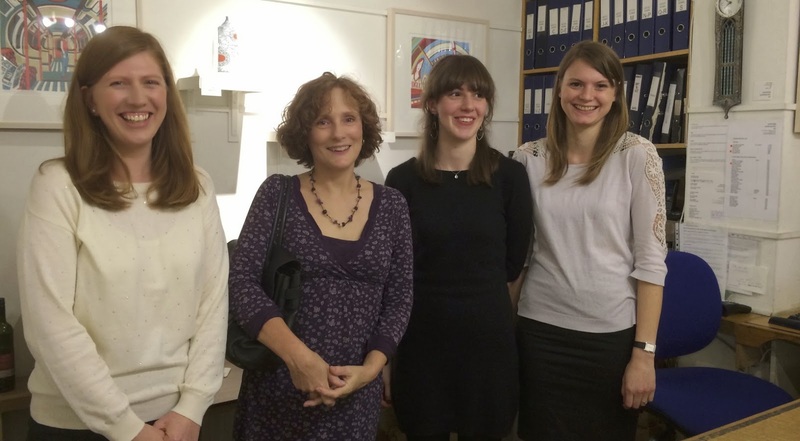 The exhibitions are organised by the Curwen and are aimed at supporting interesting and fresh art projects. 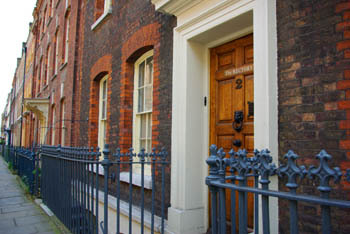 The Rectory (at 2, Fournier St, London E1 6QE) is a largely original 1720″s Hawksmoor building and the gallery is in the panelled Georgian reception rooms on the ground floor. Through an impressive doorway, is a grand hallway with a magnificent staircase, leading upwards to a private living area, and downwards to the church office. On the left are two sitting rooms, now transformed into one long open gallery space, yet retaining their Georgian splendour and atmospheric traces of a domestic space. As this is the Rector’s private home, it is only open by appointment, outside of the PV’s and First Thursdays. First Thursdays is a route through the East End of art events and gallery tours on the first Thursday of every month and as our exhibition is on for two months, we have two, on 6th June and 4th July 1-9pm). If you can’t do any of these dates and would still be interested in coming along for a viewing, please make an appointment with the Curwen Gallery, by phoning 020 7323 4700 or by emailing gallery@curwengallery.com. In any case, I will be there for the Private View this Sunday afternoon (19th May 2-4pm). Please come along and say hello! New Exhibition – Where’s the Original? 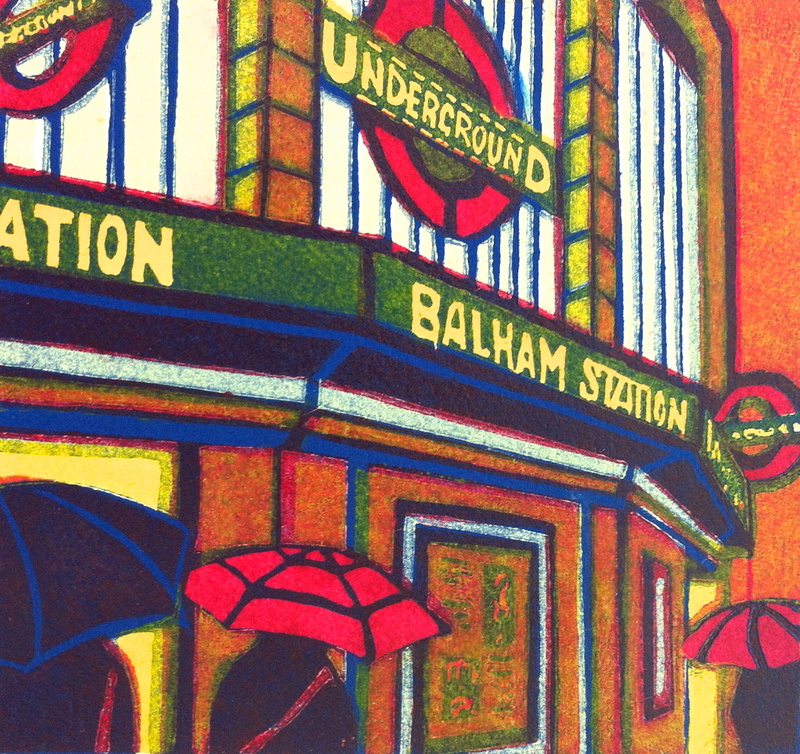 The spotlight is on a question so many people ask of a printmaker: WHERE’S THE ORIGINAL? And the answer is, there isn’t one! 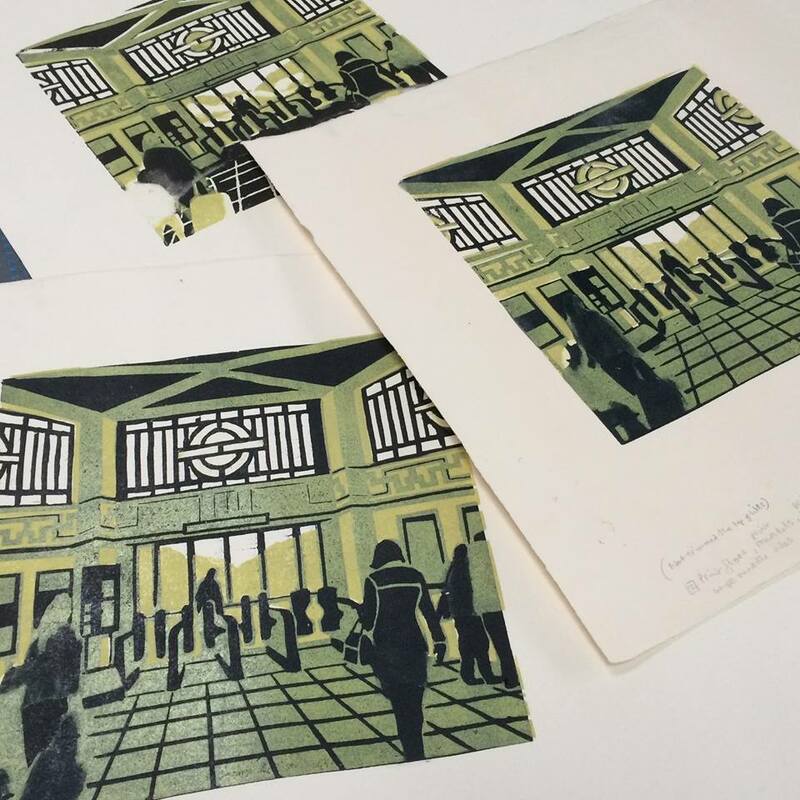 Printmakers, who create Etchings, Lithographs and Linocuts, work directly onto the printing surface, using drawings, sketches and even paintings for reference. This is not a method for reproduction of an original, but a “conversation with the medium”, a creative process that with time and expertise gives a unique result. This is an exhibition of professional artists showing limited edition prints, paintings and the sketches and reference drawings that inspired the works. These artists are: Karen Keogh; Carole Hensher; Susie Perring; Sonia Rollo; Trevor Price; Jazmin Velasco; Colin Moore; Gail Brodholt; Veta Gorner; Frank Kiely; Louise Davies and Mychael Barratt. 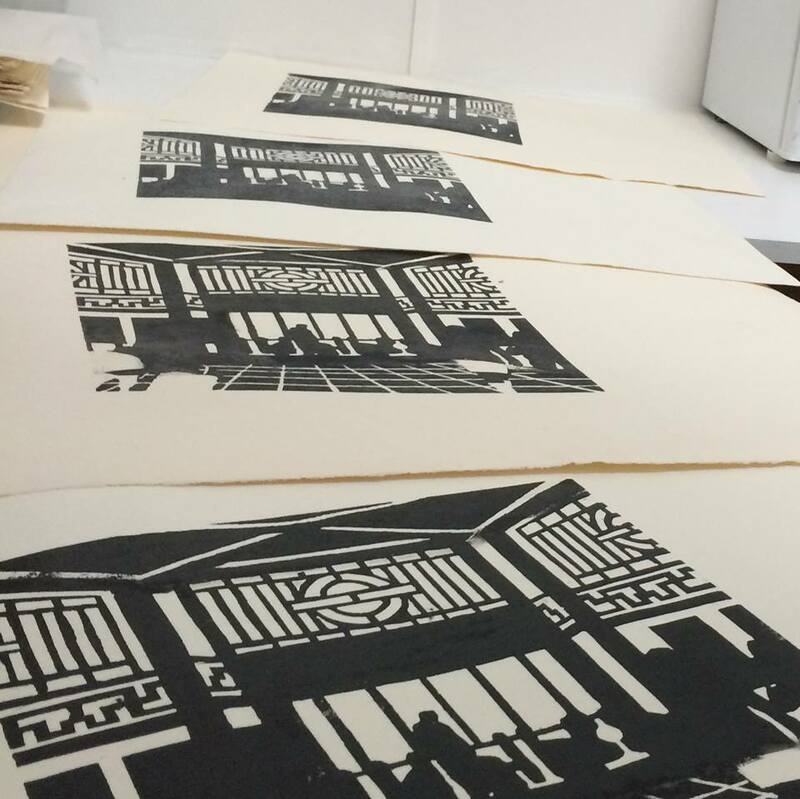 There’s the usual mild panic in the studio (or in some cases, not so mild) as we’re busy getting ready for our new London Printmakers exhibition, which is opening next week at Bankside Gallery on London’s Southbank. 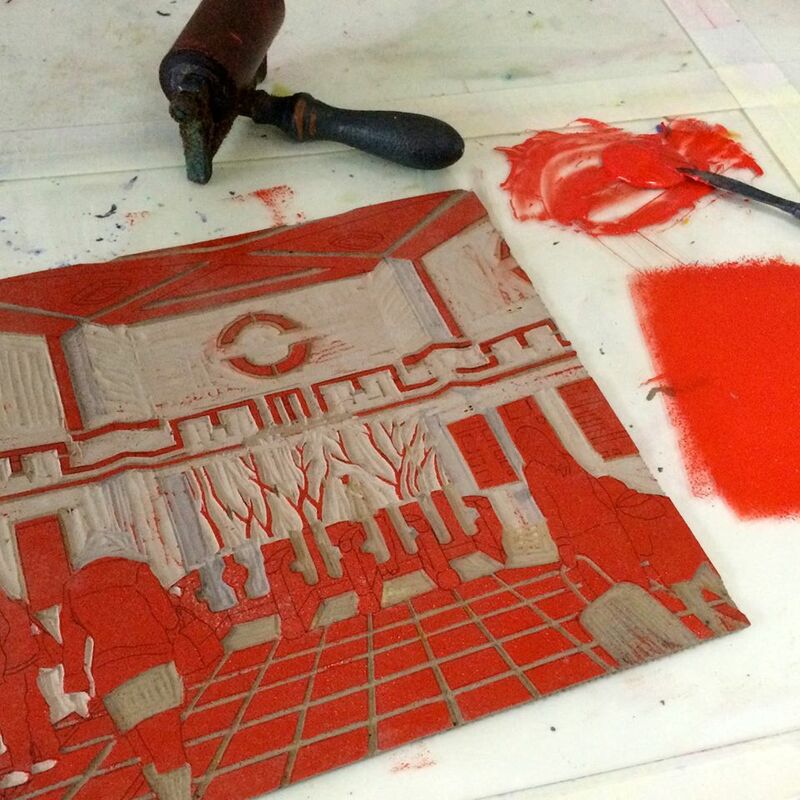 We’ve decided to call it ‘Where’s the Original?‘ as that’s a question all printmakers get asked. The idea is that we try to explain how the print itself is the original and that there is no other artwork (a painting, for example) from which the print has been taken. It seemed like a good idea at the time but it’s been more difficult than I had anticipated, trying to provide an insight into how I arrive at the finished print, and then finding a way to display it on the walls of the gallery, in a clear and visually interesting manner. In the end, I decided to frame up a working drawing (above) and a series of printing stages (below), neither of which I’m entirely happy to inflict on anyone. 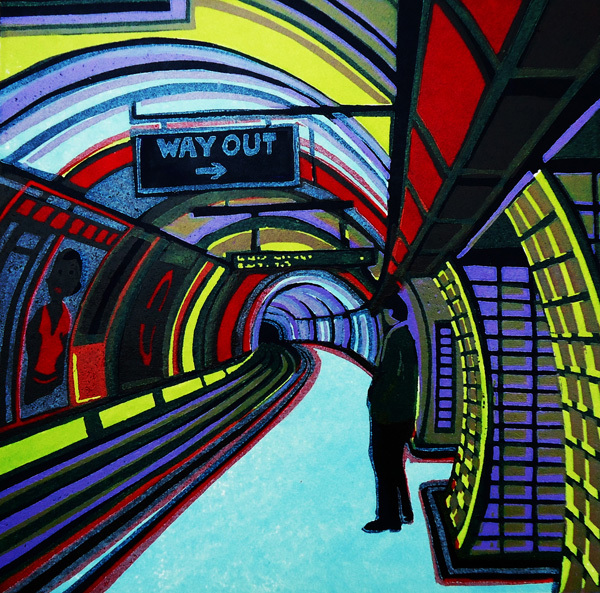 Still, someone always has to suffer in the name of Art and it might as well be the viewer…..
I’ve had two linocuts selected for the Royal Academy Summer Exhibition! The first one is Retail Therapy and below that is Remember Me. I’ve never been lucky enough to get two in before – so I’m thinking pink champagne is definitely a possibility tonight….. 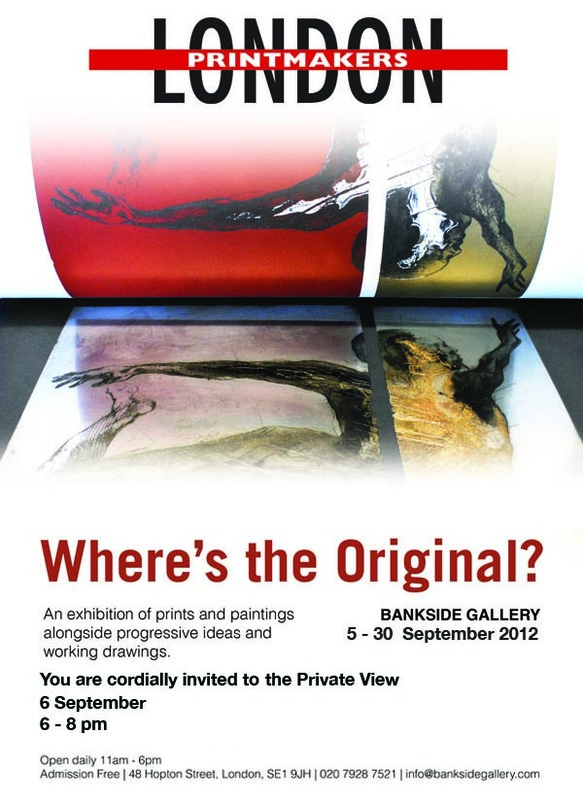 The Royal Society of Painter Printmakers’ Annual Exhibition has started at Bankside Gallery in London. It’s on for another three weeks, until Saturday 9th June. This show is always worth seeing, especially if you’re interested in printmaking, as there is a huge variety of techniques and styles on display. All the work is for sale at really competitive prices. This is a linocut called Midnight Cowboy, available framed only from Cambridge Contemporary Art. The exhibition banner in the foyer…. Colin Moore and Veta Gorner, in front of Colin’s linocuts. The show is on every day until 21st April and entrance is free. 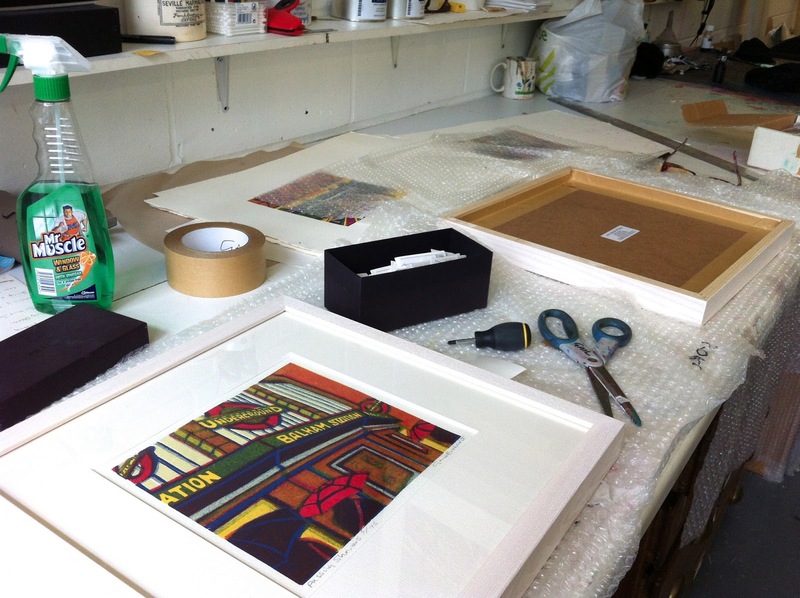 I took a drive down to Farnham in Surrey the other day to deliver some prints for the New Ashgate gallery’s summer show. It’s only forty-odd miles away but, goodness me, getting out of London is such a slog – A23 south, then on to the M25 (oh joy) and then along the A3 to Guildford. Just an hour and forty minutes to you, Madam. But never mind, it was worth it as Farnham is so pretty! Lots of lovely Georgian buildings and even a castle – I was truly smitten. Anyway, this is what I have on show there, if anyone is in the area.